For more than a century, physicians have anecdotally noted that patients with an underactive thyroid—often caused by iodine deficiency—tended to also have anemia. But the link between thyroid hormone and red blood cell production has remained elusive. That is, until two postdoctoral researchers in the lab of Whitehead Institute Founding Member Harvey Lodish, Xiaofei Gao and Hsiang-Ying "Sherry" Lee, decided to investigate. 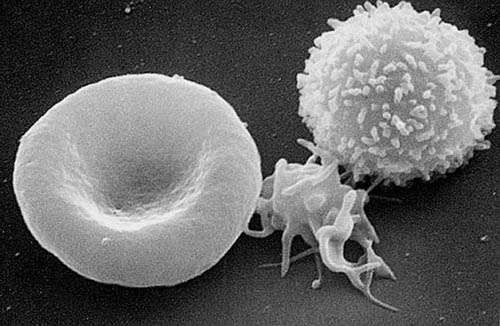 During the development of red blood cells, specialized bone marrow stem cells mature through several stages until they finally turn on the genes for hemoglobin and other red blood cell proteins and become mature red blood cells. In order to simulate this process in the lab, researchers have previously found that culturing blood cell progenitors in serum helps them turn on all of the proper proteins to take the final step and become a red blood cell. Gao and Lee, now Principal Investigators at Westlake Institute for Advanced Study and Peking University, respectively, wondered if something in the serum was key to flipping the switch to becoming a mature red blood cell. To narrow down which of the molecules in the serum is the trigger, Gao and Lee ran the serum through a standard laboratory filter that many of us use everyday for our tap water: charcoal. Long known for sucking odors out of the air and flavors from water, charcoal attracts and retains hydrophobic (water repellent) molecules. Gao and Lee noticed that once filtered, the serum no longer supported red blood cell production; they deduced that one of the hydrophobic molecules trapped by charcoal is the key to the final step of red blood cell maturation. Gao and Lee determined that when just the thyroid hormone thyroxin is added back to the serum, the red blood cell progenitors once again start down the path to maturation. Thyroid hormone's role is so important in stimulating red blood cell maturation, they discovered, that if it is added at an earlier stage of development, red blood cells short-circuit their usual developmental processes and begin turning into mature red blood cells. Gao and Lee then teased apart the mechanism behind thyroid hormone's effect on red blood cell maturation. They pinpointed the specific type of receptor inside maturing red blood cells to which thyroid hormone binds. From there, they identified a protein that is necessary for thyroid hormone stimulation and that acts as a regulator of the final step of red blood cell production. With this better understanding of the connection between thyroid hormone and red blood cell maturation, scientists may be able to identify new therapies that trigger red blood cells maturation in patients with specific types of anemia, including those with an underactive thyroid.